After his greeting to Mary the Angel Gabriel told her that her aged cousin Elizabeth had miraculously conceived a son and that she was already in the sixth month of her pregnancy. “And Mary arose in those days, and went into the hill country with haste, into a city of Judea” (Luke l:39). Medieval pilgrims to the Holy Land described the site of their meeting as a spring of fresh water near a ruined castle said to be Zachariah’s house, situated in a valley just off the road that led from Bethlehem to Jerusalem. In this painting, we see the two ﬁgures near a high, arched entrance gate. The Virgin is a grave and graceful young woman clasping her rose-covered book (there were of course no books at the time of Jesus’ birth; writing was done on scrolls), whereas the aging Elizabeth has strong and homely features. The painter has heightened the contrast between the two women by differentiating their haloes, giving the Virgin solid gold and Elizabeth golden rays. Elizabeth bends forward with outstretched hand, saying “Blessed art thou among women and blessed is the fruit of thy womb . . . For, lo, as soon as the voice of thy salutation sounded in mine ears, the babe leaped in my womb for joy” (Luke 1:42, 44). The two figures are held closely together by the green peak that rises sharply behind, isolating them from the bare hills crowned by two walled towns that perhaps represent Bethlehem and the larger and grander Jerusalem. 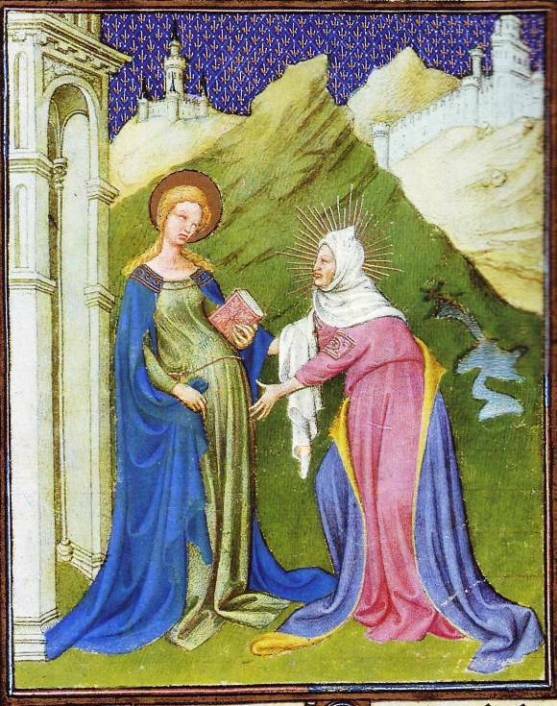 The painting of Mary’s clothing is extraordinary. The green glistens with a golden yellow where it catches the light, and the improbable blue reflects the color of Elizabeth’s cloak.